It's October. The air cools, leaves turn colors, and pumpkins are suddenly fashionable. Meanwhile, you have watched seven seasons of Game of Thrones and caught up to date on the trials, tribulations, and relationships of the inhabitants of Westeros. The finale, Season 8, is not due out until next year at the earliest. What should you do until then? For fans of the show, here are some activities a girl (or boy) can do in preparation for the new season. Chiefest among activities, fans of the show can go to the source and read G. R. R. Martin's works themselves. The St. Tammany Parish Library has multiple copies of the whole set. With some diligence, you can start and finish before the next season is started. Be mindful, the show has gone beyond the events of the books as of Season 6. Worried about having time to read? Perhaps you have a long commute? We also have the entire series available on audio book. A Knight of the Seven Kingdoms takes place about a century before the events of the show and books. 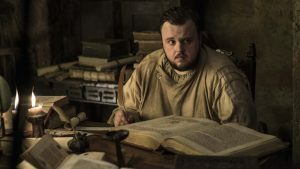 It follows the life and adventures of hedge knight Sir Duncan the Tall and his squire Egg, who eventually becomes King Aegon (not to be confused with his ancestor, the Conqueror); this Aegon was younger brother to Maester Aemon and grandfather of Aerys, 'the Mad King.' Interested in more details? Feel free to check out my earlier blog. G. R. R. Martin also published another short story relatively recently in this anthology he edited. His contribution, The Princess and the Queen is located in the back. It tells the history of the Dance of Dragons, the Targaryen civil war often referenced in Game of Thrones. This war took place about two hundred years before the show (one hundred after the Conquest) and concerns the fall of the Targaryen dynasty from their height of power, and the losses of most of their dragons. Maybe you are looking for something other to read? If you like A Knight of the Seven Kingdoms, those short-stories were earlier published as part of other anthologies. These anthologies, Legends, Legends II and Warriors are all available, and also mentioned in my earlier blog. Steven King's 'The Dark Tower' series is one of his most popular, and The Gunslinger was the first. It was recently made into a movie! Are you a fan of Queen Danerys? Take a look at Queen of the Tearling and experience a whole trilogy of books focused on a princess' quest to reclaim her mother's throne. Cersei Lannister has made lots of allies and enemies in her years on the show. Philippa Gregory's series, starting with The White Queen, is historical fiction based on the conflict that inspired Game of Thrones, the War of the Roses. Have your own plans during the long Winter? Feel free to share a comment or recommendation about what you plan on doing until Season 8 hits, or The Winds of Winter is finally released.